Traditionally football coaches have the opportunity to attend clinics in the Spring and Summer to learn from coaches at the top of their profession and network with coaches across the state. These clinics can offer insight into what has made these coaches and their programs successful. College coaches offer additional educational opportunities by extending invitations to high school coaches to visit their facilities and attend Spring practices. Together, these opportunities help to expand our knowledge about all aspects of football, developing successful programs and well-rounded athletes. These clinics are typically well-attended, covering numerous topics in a lecture hall setting ending with occasional Q&A sessions. Unfortunately, attendees must take their own notes from the presentation, and they have limited time to participate in the Q&A sessions. At the conclusion of the clinic, the presentations are also not readily accessible for coaches to review and archive for future reference. Coaches from all over the state and nation come together to share ideas and develop their professional network. Outside of the clinic coaches have the opportunity to learn from each other through informal meetings and direct discussion. We learn more from each other when we can directly engage someone in conversation. Coaches sharing thoughts, ideas, and philosophies about football promotes our professional growth and the development of successful programs. 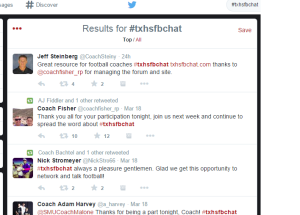 To create a forum for coaches to engage in continual professional growth, I began #txhsfbchat on Twitter. Twitter is an amazing social network that gives you authentic, direct engagement with someone about whatever subject you wish. A Twitter chat focuses that conversation and brings in a much larger audience that each participant can learn from while also providing their own voice to the learning process. Since #txhsfbchat began, coaches from Texas and across the United States come together Wednesdays at 8 pm CST to answer questions, engage with other coaches directly, and learn from each other. Questions are provided for participating coaches to answer and interact with each other while driving their own professional development and expanding their personal learning network each week. It is an amazing learning experience as this wealth of knowledge from head coaches to assistants is shared every week. We have discussed position work, off-season programs, character education, offensive and defensive philosophies and many other topics in our continuing conversation. Connections are being made with coaches all over the state of Texas as well as coaches from the rest of the nation. All in the spirit of becoming better coaches, and to grow in this game that we all love. Many school districts in Texas and all over the United States are recognizing Twitter chats as authentic forms of professional development and even crediting participants with PD hours for their answers and activity. I believe that #txhsfbchat provides coaches with this same opportunity to be active participants in their continuing education. Instead of waiting on those one or two weekends out of the year to cram as much info from each speaker as we can into our notepad, we can learn from each other every week by using social media. It is a powerful educational tool when put to good use. Please join us every Wednesday at 8pm CST and take control of your professional development as a football coach. 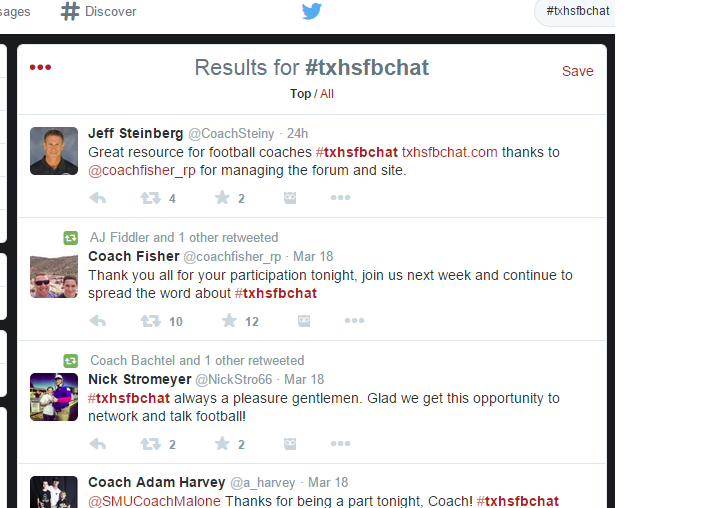 Just search for and follow #txhsfbchat. The chat is always archived on txhsfbchat.blogspot.com. Coaching at the middle and high school level may require you to become a teacher, which requires a bachelor’s degree and teacher certification. To prepare for teacher certification, you typically need to major in a specific subject area, such as math, physical education, English or history. You will also need to complete coursework focused on education and complete a student teaching experience.